Matthew Sorenson (left), Medical Director of the Outreach and Health Ministry Program, consults with a patient. Making it through a winter season of snow and extreme cold can be difficult for all of us. But winter conditions can pose extra challenges for individuals experiencing homelessness as well as The Night Ministry staff members who provide mobile outreach services. 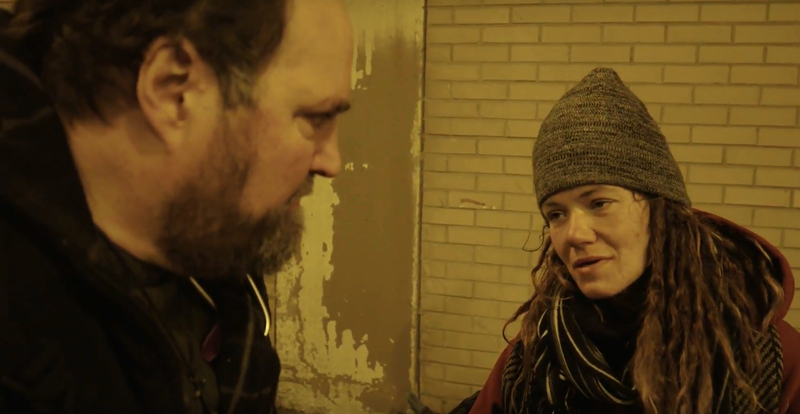 "The conditions of homelessness make recovery from some of the more common winter ailments much more difficult," said Matthew Sorenson, Medical Director of The Night Ministry's Outreach and Health Ministry Program (OHM). "When you have a cold or the flu, you are supposed to stay home and get rest. Let's say you are staying in a tent along the Dan Ryan Expressway. How are you able to do that? All the things we are supposed to do when we're sick, it's far more difficult to do when you are homeless simply because of the situation and environment you are living in." Exposure to extreme cold can cause frostbite. But Sorenson said OHM staff often see the consequences of frostbite rather than the condition itself. "Let's say you were sleeping on the street and you wake up, you may have some frostbite. By the time we come around, you may have been up and moving and been able to thaw. But we'll see the skin breakdown," he said. "A lot of time what you are seeing with frostbite is tissue destruction. The ice is basically damaging tissue and the crystallization of ice can also cause damage." Sorenson said there are other health challenges that exist all year but that present themselves more frequently in the winter because of an increase in risk factors. For example, arthritic symptoms are more prevalent during the winter because of the increased physiological stress brought on by living outside in the cold. "If you are staying in Lower Wacker, you are sleeping on a surface that's not exactly going to be kind to your body, and now let's make it cold. With that added stress, it's not uncommon to see more symptomatology for arthritis that we may in the summer or fall," he said. Foot care is another year-round challenge for many individuals experiencing homelessness, but Sorenson said it can be particularly acute in cold weather because people are less likely to remove their shoes. "If the shoes get wet, that moisture gets trapped in the shoes. So you have somebody who could be wearing their shoes nonstop for a period of several days. It gets damp in there and they're having breakdown of the skin as a result of that." According to the 2018 OHM Street Survey, more than half of Health Outreach Bus clients are living in apartments or houses. Case Manager, Mirella Rodriguez, said more clients who do have housing ask about rent and utility assistance when the weather turns cold. "They're trying to prevent being evicted during the winter months or they need to pay their utilities, so I offer them information about emergency funds or legal resources to prevent eviction," she said. When this winter season started, Rodriguez said she also began getting more requests for information about food support resources. "When the weather turned cold, every day that I was at New City or South Shore stops, somebody was asking about food pantries," she said. "They may be trying to make rent and utility payments and probably don't have a lot of money left over for food," she said. "While some clients haven't applied for food benefits others are getting such a small amount that they don't have enough food to last them for a whole month." Both Sorenson and Rodriguez said winter can complicate how they are able to serve patients and clients. "This time of year definitely limits the types of health exams we can do, and it often has to do with how many layers of clothing a person is wearing," Sorenson said. "People are reluctant to get out of all the clothing they are wearing because it takes so long to pull the layers off and get them back on." "It really affects our ability to examine an area, to get underneath the layers of clothing to see what's there and see what the issue is," he said. Rodriguez said she does see more requests for shelter from clients when the weather gets cold, which can be a difficult conversation because there are often limited options for immediate placement. "Many are reluctant to go to a shelter. For example, they're afraid they're going to get hurt if they go to certain places. So I ask them if they can stay with family or friends that they can trust." "Or I try to locate the closest emergency room or police station where they can go to get warm," she said, adding that as a last resort she might provide a client with a bus card so they can ride public transportation or a gift card for a restaurant that is open 24 hours. "I encourage clients when the weather is warmer to start the process of signing up for housing, so they don't face this situation in the winter," Rodriguez said.